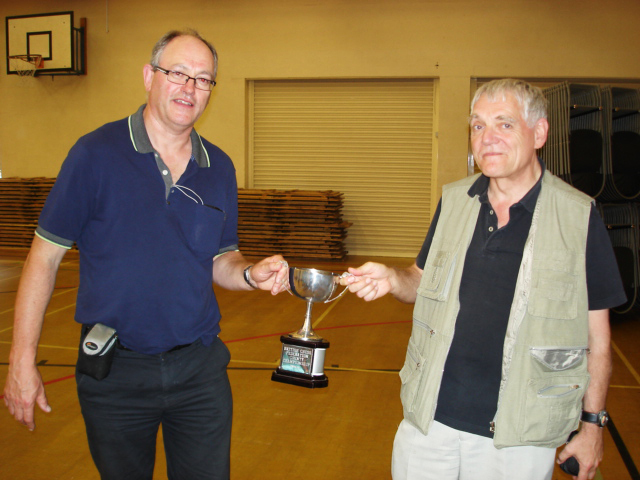 Four Club members recently represented Warwickshire in the 2010 – 2011 ECF County Championships: Roy Hadfield, Peter Leggett and Guy Greenland competed in various rounds of the U120 section, and Mark Armitage followed suit in the U100 section. All four players enjoyed some memorable games and pleasant trips to the various venues. After several matches, both teams were successful in reaching the Grand Finals held in Leicester on 2 July 2011 (during a heatwave!). Peter, Guy and Mark played in the Finals (Roy was unavailable, unfortunately) with the U120 team being victorious by the narrow margin of 6.5 – 5.5 against Lancashire, the U100 side being beaten by Essex 3.5 – 8.5. I can highly recommend playing on the ECF County Chess Championships and please contact me for more information if you would like to play in the forthcoming event. Above is a photo of Guy and Peter with the U120 Trophy.